One of the ways that can be described as most convenient is a wireless device. 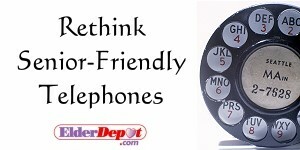 It can allow the freedom to be "on the go" and not anchored down to a land line. There are a variety of cell phones for the elderly that achieve the same end however, having one for your parent is potentially a good way to reduce the stress on a caregiver that needs a communication device when the device is light enough and portable enough to make it easy for them to carry in their purse or pocket on errands, trips out of town or even from room to room in their own home. that they use a mobile phone by excuses that they don't need one or the service is too expensive (even if the caregiver pays for the service), when in reality the issue may be that they can become confused with how it operates or are reluctant to try something new. keep it simple, less is more, potentially when it comes to an elderly parent and technology. The best approach is to find an end of cycle or starter model that may not have all the bells and whistles but for this type of use works just fine. could be a possibility, and reduction of this type of worry to the aging parent could make the transition from total rejection to daily usage go a little smoother. definitely a plus to find a dealer that offers a plan that is of a finite limited duration and/or can be customized for local use only, variable minutes per month, or fixed price/minutes per month. In this way you could minimize cost without sacrificing the ultimate goal – staying in touch. 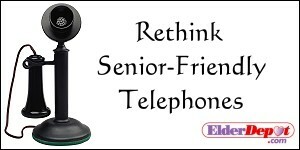 it is important to take the time to teach the your senior to use the device and to limit the number of functions they have to accomplish to remain in contact. Some of the cell phone functions to go over with them could include: Turn on/turn off, dialing, speed dialing, hanging up, battery usage and how to charge the battery and placement of the battery charger in a prominent safe place for easy access. Calling them a few times as a test while you are teaching them is something you should consider. consider inputting certain numbers for that they may need to use on a regular basis, i.e., caregivers, medical, ambulance, 911, family members. These numbers may help when taught correctly and reinforced when memory begins to fail. Wireless devices for elderly parents can be a great idea for caregivers when faced with the stress of keeping tabs potentially on a day to day basis. Knowing that Mom and Dad are at the grocery store or even at their home and being able to reach them quickly and easily can be a stress reducer because as the old saying goes "one less thing.......".